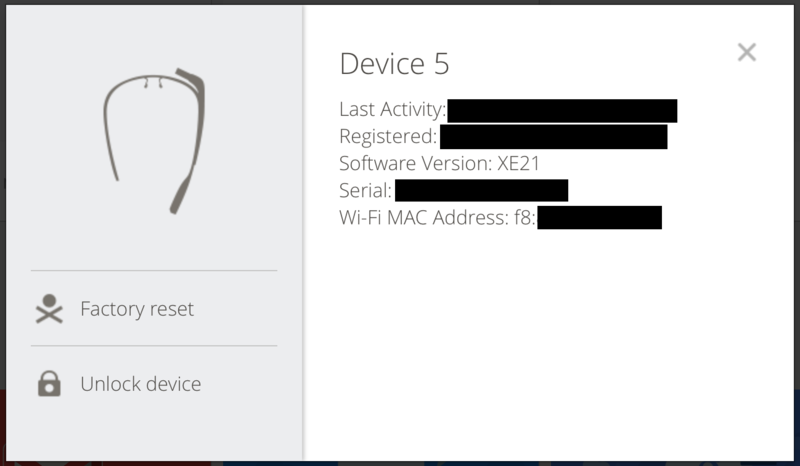 So, today I needed to find the MAC address of my Google Glass so I could get an exception made on a Firewall for screen casting at an upcoming conference (Venturefest York). This was more difficult than expected (partly because of Glass, partly because of my situation), so I thought I’d explain the method that’ll reliably work for people in a similar situation. On most pieces of technology with networking functions, the MAC address is printed on the side of the packaging. Saying that, I can’t think of a piece of technology where this hasn’t been the case for me. Unfortunately, in this age of ‘Unboxing is Theatre’ and minimalistic packaging, Google omitted this on the Explorer Edition. So, the first normal step then would be to go to the Settings app (if on a desktop or mobile device) or the control panel (if it’s a networking device) and find it there, but since Glass has such a (beautiful) minimalistic design, information not vital to the day-to-day operation of Glass is hidden. Next, you’d normally look in your router’s control panel and find a connected device with a name matching the name of your Glass. Unfortunately, I’m on a large organisation network without access to this kind of control panel. 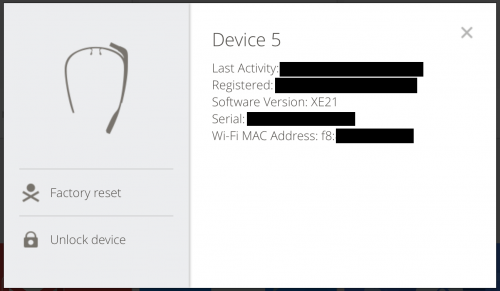 I experimented with creating a personal hotspot from my phone for Glass and a Laptop, but then when I queried Glass for it’s MAC address with the arp utility it returned nonsense. You’ll need the ‘adb’ utility – download the Android SDK if you don’t have it. Enable dev/debug Mode on your Glass (Settings -> Device Info -> Turn on debug). Plug Glass into the computer you’ve got adb installed on. So there we are! Easy once you’ve found how to do it. This entry was posted in Computer Science, Google Glass and tagged address, find, google glass, MAC, router on March 13, 2014 by Sam.